By nature Dad Fairbanks was of the stuff that produced Daniel Boone and Kit Carson. If he'd been with either, his long strides would have kept him well in the lead, grumbling at the slower pace of the others. He itched for new fields and new adventure— he found both in the Death Valley country. Here are highlights in the life of a man whose courage matched the trials of a forbidding and ruthless land. To Death Valley country came a long, lean adventurer. A tough frame that fitted the hard, hungry land. A fine frank face. Keen, steady brown eyes. The poise of a square shooter, sure of himself. His chief assets were hope, tireless energy and a wife whose courage matched his own. The Indians promptly named him Long Man. To a later generation and to thousands of tourists who have stopped at Baker—southern gateway to the Big Sink at the bottom of America, he is known as Dad Fairbanks. Not long ago one of these tourists stepped from a Rolls-Royce and walked into Dad's station. "Remember me?" "Face is familiar," Dad said. "Twenty-five years ago you loaned me some money." "I've loaned money to a lot of fellows," Dad parried. "But I never paid it back," the stranger added. "A helluva lot of 'em didn't," Dad answered. The tourist reached into his pocket, peeled off $1,000 from a roll and handed it to Dad. "I borrowed $300 from you and left the country. Fm Harry Oakes. Where's Ma?" Dad led him to the Fairbanks cottage nearby, and there with Celestia Abigail Fairbanks they sat down to talk about old times and changes. Since those days Harry Oakes had become the largest taxpayer in Canada. His guests are served on gold plates. With a partner, W. H. Wright he learned that the title to a certain gold claim would expire at midnight on a certain day. They sat up in a temperature 40 degrees below zero until the stroke of 12, and restaked the Lake Shore mines— Canada's richest gold property. Luck is like that, any desert man will tell you. Dad and Ma Fairbanks too had attained fortune. Not as much money as Oakes, but wealth nevertheless vast as the far-flung skies. Friendships. A lifetime of helpfulness. Riches infinitely beyond measure in dollar value. Long Man became as much a part of Death Valley country as the Salt Pools— inseparable from its history and its legends. Fifty years ago you didn't get into your car and speed through the country for a weekend trip. Your progress was one mile per hour to four or five—provided you didn't lose your way, and if you escaped the hazards of heat and lack of water and didn't add another pile of bones to the toll of a murderous sun. When Ralph Jacobus Fairbanks went into the country he decided that to lick the desert you had to know it—its trails, its water holes, its tricky moods. Accordingly, he engaged an Indian known as Panamint Tom, a brother of the notorious Hungry Bill, to show him Death Valley. Travelers of the early days were warned, "Keep your eyes open and your finger on the trigger. That's Hungry Bill country." It was believed that Hungry Bill could have explained the fate of many men who went into the desert and never returned. But Fairbanks was unafraid. After leaving the main traveled road, Dad said to Tom: "This is Indian country. You go first." He was taking no chances. At night he directed Panamint Tom where to spread his roll, then chose the site for his own. Both men carried six-guns. When the trip was over and they again reached the main road, Panamint Tom said to Dad: "This is white man's country. You go first." Dad did. In later years, they often talked of that trip. "Long Man, you heap scared," Tom said. Dad confessed he was. "Me too," Tom chuckled. The Panamint at this period was a favorite lair of wanted men. Once there, they were usually safe. "Hungry Bill got his moniker from his incessant begging for food," Dad recalls. "He was a bad hombre and hated the whites. The Hungry Bill ranch in Six Springs canyon is one of the landmarks of Death Valley. 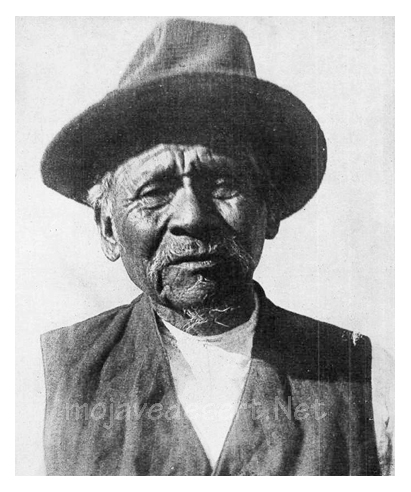 Once, Herman Jones of Shoshone hired an Indian boy from Ash Meadows, known as Johnny, to help him on a prospecting trip. Approaching Hungry Bill's ranch, Johnny balked and Herman had to use his gun as a persuader. When they quit work and made camp, Johnny dropped down on the ground, pulled his hat over his eyes and went to sleep. "After a few moments, Herman heard a stir, looked about and saw Hungry Bill. Simultaneously Hungry Bill saw Johnny. His eyes narrowed. Then a tense gleam came into them, like that of a wildcat seeing prey. Without a word he tiptoed toward them, and treading lightly, circled the sleeping boy. Then he stooped, peered under the hat, rose and turned to Herman: "Him no-good Indian. Me kill him for you." He stepped aside, drew his gun before Herman realized his intention. With a warning shout, Herman whipped out his own gun and prevented the slaughter. "Why did Bill want to kill him? Well, sometime before, Johnny had fallen in love with a Panamint Indian girl and in accordance with tribal custom, had paid Hungry Bill $20 for the privilege of marrying her. Johnny took his bride to Ash Meadows, but she pined for her Panamint and ran away. Johnny went after her and for another $20 Hungry Bill ordered her to go back with him. Again the girl left him. Johnny decided twice was plenty and killed her, and this was Hungry Bill's first chance for blood vengeance. "It was a hard, raw land. Many of the earliest settlers were still living. Most of them tough. But they paid their debts and shot from the hip." Among famed bandits who found a hideout in that area was Tilly Younger. At 14 years of age he had belonged to the Jesse James gang. The Younger Brothers succeeded those outlaws. Turning prospector Tilly behaved himself except for an occasional brawl. In one of these at: Good Springs, Nevada, he chewed off one of the ears of Jack Longstreet and cropped the other. Jack was also a killer. " When he was 90 years of age Younger walked into Shoshone one night and asked for a bed. Fairbanks gave him a cabin, lighted the lamp. "Blow it out," Younger ordered. "I've gone to bed for dam' nigh 100 years without a light.'' Younger didn't appear at breakfast and Dad went to his cabin. "He was dead," Dad said, adding: "That's the way to die. Go to sleep and forget to wake up." In those big spaces one learns that life is not a perpetual lease and accepts death as just one of nature's casual facts. 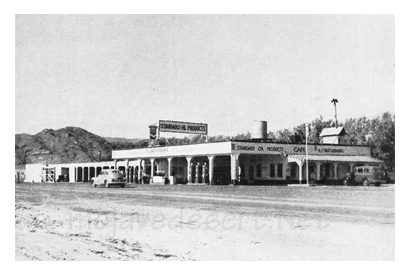 Fairbanks started the first restaurant in Beatty, Nevada. Later he decided that a supply station on the route of the Goldfield rush, where people could stay overnight and feed their teams, would be a paying enterprise. At Ash Meadows he found an abandoned ranch with good water and was amazed to see a luxuriant crop of wild hay. Hay was worth $200 a ton. Learning that the long absent owner lived in a remote canyon, he drove all nisht and arrived at daylight to dicker. "The ranch is all right," Dad complained guilelessly, "but it'll cost more to get rid of that wild grass than the ranch is worth." When the owner said it could be plowed under easily, Dad surmised the man didn't realize the value of the hay now that the once lonely road going by the place was jammed with teams headed for the gold fields. "I figured he'd take $1,000," Dad said. "It was worth $5,000 to me, so I offered him $2,000. He snapped me up. I wrote out an option on the spot and made him sign it. 'Now I'll drive you in and we can have the deed made out.' That suited him. I never let him out of my sight, for fear some fool would jump my offer. If he wanted to see a fellow, so did I. If he wanted a drink of water, I went along. Finally we got the deed made out and I paid him. He hurried away." The deal closed, Dad breathed a sigh of relief and went out on the street where he met Ed Metcalf, a desert mining man, chuckling to himself. "What's so funny?" Dad asked. Metcalf pointed to the recent owner of the ranch, surrounded by a group of men laughing loudly. "Why, that fellow was just telling me about a sucker he gaffed. He had a ranch here that he'd been trying to sell for $500. Some dam' fool gave him $2,000." Dad gulped, and turning to Ed he said weakly: "Come on, Ed, I'll buy the drinks." "It turned out all right, though," Dad said. "Help was scarce and I had to hire a city fellow to feed the teams that stayed overnight. He knew nothing about hay or horses. He would fill the racks at night. The next morning there'd be more hay on the ground than the horses had eaten. He'd fork the hay up, shake it out and throw it back. The fool didn't know a horse won't touch tainted hay, so when the next team came along, the racks were full, but the teams only sniffed at it. Used over and over like that, I figure I must have got a dollar a pound for that hay." Dad himself operated a freight line as far north as Goldfield, doing a monthly business that reached into many thousands of dollars. It was a long haul over terrible roads and when he had cussed a 16-mule team into Goldfield, he was ready for diversion. He was the gregarious sort— loved poker for its thrill. The matter of stakes was inconsequential, provided of course he could bet $10,000 or $12,000 on his hand. One night in such a game he found himself sitting alongside a fellow who had removed his big overcoat with enormous patch pockets, and hung it on his chair. Dad noticed intermittent movements of this fellow's broad palm from the cards he'd been dealt, to the pocket. Finally Dad saw the crook had cached every ace in the deck. Later Dad opened a pot. Everyone stayed. The crook raised the ante. Dad raised him back. Others dropped out, but this fellow stayed. Each drew a card and the real betting began. Dad bet $1,000. "Have to raise you $5,000," the other said. Dad called it. With the confidence that came from the cached aces, the shark smiled exultantly as he laid down four kings. "I reckon that beats you," he shot at Dad and started to rake in the pot. "Not so fast," Dad ordered and spread out four aces. The crook gave him a quick look but Dad's eyes were steady. Neither said a word. The crook couldn't. He knew that Dad's long fingers had found his pocket. The same world famous mining engineers who, after examining Tonopah and Goldfield, declared that neither would produce enough ore to pay development costs, now advised Char'es M. Schwab, president of Bethlehem Steel, that Greenwater, on the eastern slope of Black mountain would prove to be the world's largest copper deposit. To those deceiving nil's Dad followed the stampeding crowds. Wrong at Goldfield and Tonopah, the engineers made it three in a row by being wrong about Greenwater. It proved to be a dud, but Dad stayed to the bitter end. "This town'll come back, Ma." he kept telling his wife when the weeds began to obscure the doorsteps of the empty houses about. But the weeds grew and seeded the streets. The noises of tinny pianos and scraping feet no longer broke upon the desert night and Dad's faith at last wavered. "Ma, we've got $10 left." Then what seemed to be an angel unawares, dropped in on the Fairbanks' in the person of a mining promoter. "I'm opening up a mine about 28 miles below," he told Dad, "but I've got to find somebody to board about 30 men." Dad's eager eyes kindled. He could feed 'em and sleep 'em for $60 a month. "I know of a water hole down that way. Place called Shoshone." "Fine. The mine's close by. Get ready." When he had gone Dad said, "Ma, 30 boarders at $60 a head is $1,800 a month." "But there're no buildings for us there," Ma reminded him. Dad gestured toward the abandoned houses strung along the deserted streets. 'I'll haul some of those down. Get Charley to help." Charley is the present Senator Brown of Inyo county. Then he was just a husky youngster, trying to coax the beautiful Stella Fairbanks into marrying him instead of a debonair chap known to Greenwater as the Rattlesnake Kid, because of his hobby— hunting rattlers to make ornaments of their skins. Today where Greenwater stood, there is little to remind one of the hectic crowds that poured through Dead Man's canyon or struggled up through Congress wash. The faded leg of a pair of overalls protruding from a covering of sand. A sun-baked shoe lying on its side. A pile of rusty tins. Broken bottles purpling in the sun. But somewhere under the crust of gravel and sand there is a case of champagne, which Dad Fairbanks buried so well he never could find it. Dad hurried the preparations at Shoshone. The $10 had been invested in canned soups, meats and vegetables and the Fairbanks' were all set for the boarders. Then he learned the brutal truth. The angel unawares, was just an engaging liar. The boarders never came. Dad picked up the canned goods, arranged them on a table in front of his shack and put a sign up that read: "Store." That was the beginning of Shoshone. In time Shoshone seemed to be crowded. Too many shacks over in the jungle, as they call the thicket of mesquite. Altogether there may have been 18 or 20 people within a radius of a mile—provided you included squaws and their children and the three or four old-timers living in the dugouts thev'd chiseled in the chalky cliffs of Dublin's Gulch. Dad began to feel that civilization was closing in on him. By nature he was of the stuff that produced Daniel Boone and Kit Carson. If he'd been with either, his long strides would have kept him well in the lead, grumbling at the slower pace of the others. He itched for new fields. On what is now known as Highway 66 [I-15] there was a siding called Baker. It was a barren, desolate place. In summer it is comparable to a slab of hell. Soda lake picks up the sun's rays and sends them forth red hot on the blasts that sweep down from the Devil's Playground. In winter one yearns for the balmier climate of Siberia. But from Baker one goes north into Death Valley and on to Beatty and Goldfield. So Dad sold out to his son-in-law, Charley, and moved again. With a store, a gas pump and a few cabins, the strategic location got 'em going and coming. Once, stopping for dinner at Baker, I met Dad coming out of the dining room. "How's the fare?" I asked. Dad eyed me. "You hungry?" "Hungry as a bear," I said. "All right. Go on in. A hungry man can stand anything." Then he added in an undertone: "Employment agent sent me the world's worst cook, but—" His voice trailed off as he hurried to a car waiting in front. It is fitting to end this story of Long Man with the statement that when Dad decided to retire, the store had expanded, the string of cabins had lengthened and the Standard Oil company was glad to lease only the long battery of pumps at a figure insuring independence for life. But it is a bit ironical to add that after all the years in the awesome silence of Death Valley country, Dad Fairbanks views the passing throng from a house in Hollywood. "I'd never have thought it of you," I kidded. "Hell—" Dad retorted, "I needed solitude. Haven't you got sense enough to know that the lonesomest place on Godamighty's earth is a city?" 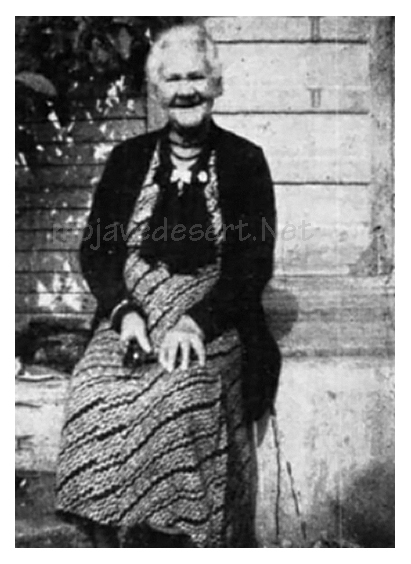 "Ma" Fairbanks who mothered hundreds distressed in the wastelands. 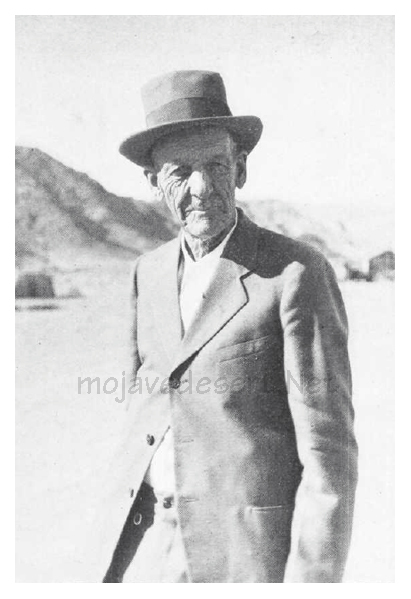 Thousands of tourists have stopped at Dad Fairbanks' caravansary in Baker, California, for a glimpse of the man who has brought in many men lost in the forbidding areas around Death Valley, Frasher photo. From cliffs above Death Valley Panamint Tom saw the death struggles of the Bennett-Arcane party in 1849.